The Extended Range course picks up where Extended Range Nitrox leaves off and takes your training as a tec diver further and deeper. Extended Range qualifies divers to make extended no stop dives, and accelerated decompression dives to a maximum of 150ft using nitrox mixtures of up to 100%. You’ll learn to make gas switch, extended no-decompression dives using air and enriched air to 150 feet, prepare for and respond to foreseeable technical diving emergencies, and master the basic skills and procedures you’ll need as you move into deeper technical diving. Double cylinders with dual manifold and decompression cylinder (will be supplied). Two primary regulators and one secondary, deco regulator – One (1) primary regulator must have seven foot / two-meter hose for air sharing. Deco regulator must be O2 serviced. Backplate or soft pack with harness with shoulder and rigid hip D-rings. 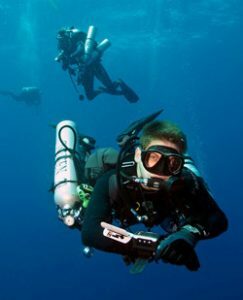 Students with the SSI Sidemount Diving certification or equivalent that meet all other prerequisites may participate in XR programs up to Technical Extended Range Trimix using an approved sidemount configuration, as long as they have all the components of the XR Sidemount Total Diving System for that program. Contact us at 303-789-2450 to begin! Subscribe to our e-mail newsletter NOW to receive updates, learn about sales, new classes and more! Travel with A-1 Scuba on a guided group trip to an exotic diving location! A-1 Scuba boasts one of the top scuba training facilities in the nation. Tour the facility online here or drop by anytime. Check out our recent group travel photos! Learning to dive is fun and the perfect activity for the adventuresome. For many it has "changed their lives forever!" Since 1959, Colorado's largest scuba facility, serving Denver, Littleton, Aurora, Englewood, Centennial, Highlands Ranch, Lakewood, Wheat Ridge, Westminster, Greenwood Village, Lone Tree, Morrison, Evergreen, Golden, Arvada, Castle Rock and Parker. © 2019 A-1 Scuba & Travel Aquatics Center. All Rights Reserved.